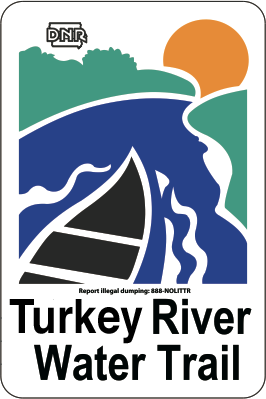 The Turkey River Water Trail is 98 mile stretch of the Little Turkey and Turkey Rivers in Northeast Iowa connected through signs, maps, and river access points that provides an enjoyable, scenic and educational experience for recreational users. The 98 mile water trail begins on the Little Turkey River at Gouldsburg Park and flows southeast through Fayette and Clayton Counties toward the Mississippi River. 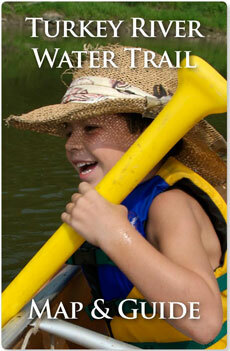 The Water Trail features beautiful scenery, diverse wildlife species, and numerous historic landmarks. 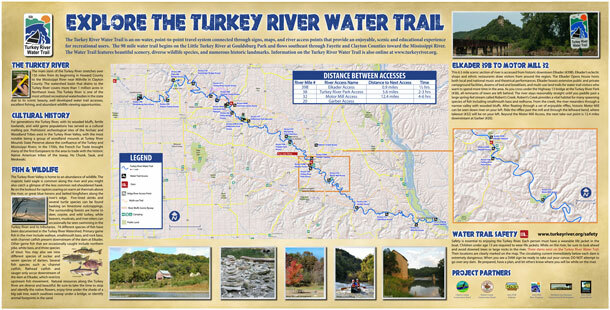 The Turkey River Water Trail Map & Guide is available for order online, download in PDF format, or for pick up at several Northeast Iowa locations. What is a “Water Trail”? Iowa’s Water trails enhance recreational experiences for all water recreation enthusiasts, including but certainly not limited to canoeists and kayakers. A water trail is defined as an on-water point-to-point travel system with multiple access points, and a recommended route connecting the points. On a river or stream, this may allow for downstream travel. On a lake, a water trail might hug a shoreline and include openwater crossings at strategic points. Find digital maps for other water trails on the Iowa DNR’s River Programs website. Gouldsburg Park (#98) is a multi-use recreational area marking the official put-in and beginning of your water trail journey down the Turkey River. Here, Crane Creek merges with the Little Turkey River and flows peacefully downstream for 12.2 miles before merging with the main stem of the Turkey River at Eldorado. A shorter 7.7 mile day trip can be made by taking out at the Auburn access (#90). the river provides extraordinary scenery for several miles. Large limestone boulders covered in moss and ferns line the bank. Above you, hardwood forests claim the bluffs with the white bark of aspen trees lightly scattered in. Smallmouth bass and native sucker species can be seen darting upstream in the frequently crystal clear river. Surprisingly abundant freshwater mussel beds (clams) can also be seen in this stretch, an indicator of a healthy aquatic com- munity. Past the Auburn access the valley starts to widen. After joining the waters of the Turkey River you pass under the Highway 150 bridge and an access can be found shortly after the bridge on the right. The 5.7 feet per mile gradient of this stretch provides frequent riffles. Venture downstream from Eldorado on this particularly scenic stretch, and you will encounter pine-topped limestone bluffs on your way past Huntzinger Bridge Access (#79). Other access points along the 109-mile River Bluffs Scenic Byway include the Turkey River Canoe Access (#71) and the Tessmer Access (#68). Just upstream from the City of Clermont, you will see warning signs as you approach the Clermont DAM. As your round the final bend before the dam, there will be a bluff on your right. You must portage, and takeout is on river-right at Clermont’s River Park (#64A), where you will find nice restroom facilities, a picnic shelter, play area, and a universally accessible viewing deck. This five mile section of the Turkey River Water Trail meanders through one of the most popular segments of the river. Users will encounter some white water, unequaled scenery, and one of the best fisheries on the river. Clermont is known as “Brick City” and is the home of several historical sites, including the Montauk mansion. Those looking to camp can enjoy the Skip-Away Campground and Resort. This private entity sports an RV park, restaurant and lounge, as well as tube and canoe rental. Clermont’s business district provides restaurants, a convenience store, as well as antique, gift, and art shops. Floating downstream from Clermont (#64B) you will come to the Valley Canoe Access (#62). This launch is in the center of an expansive valley known as the Shin Bone Valley, named as it is home to sacred burial grounds for many generations of Native Americans. From the Valley Canoe Access, continue downstream to Elgin, a town known as the “Little Switzerland of Iowa.” There you will find the Gilbertson Conservation Education Area (#59E & 59W) which offers modern and primitive camping facilities, a variety of trails (universally accessible, equestrian, cross country skiing, and bicycle) along with the Gilbertson Nature Center, historical museums, a petting zoo, bird watching and the internationally renowned Maize Maze. This section of the Turkey River Water Trail begins at Gilbertson Park (#59) and soon enters Clayton County. This float of 11.9 miles features a mean- dering river and a landscape of bluffs, timbered shorelines, and the serenity of nature. The visitor may encounter bald eagles, whitetail deer, and the occasional river otter. Exit on your left at Big Spring Trout Hatchery (#47), or continue 1/2 mile to exit right at Frieden Park (#46). Be aware that there is no bridge between the Big Spring Hatchery and Frieden park. You will begin your journey at the largest spring in Iowa: Big Spring. Here, the Iowa Department of Natural Resources rears trout to catchable size and stocks them into 19 Northeast Iowa fishable streams. Across the river, but keep in mind there is no bridge, is Frieden Park (#46). From Big Spring (#47) it is an enjoyable 7.6 mile voyage down river to the Elkader Takeout (#39A). About one mile downstream on the right bank, a large bald eagle nest may be seen at the top of a cottonwood tree. Eagles can be found soaring on thermals above the bluffs as you paddle this stretch. This 6.5 mile scenic section of river is accessed from historic downtown Elkader (#39B). Elkader’s eclectic shops and ethnic restaurants draw visitors from around the region. The Elkader Opera House hosts both local and national music and theatrical performances. Elkader boasts extensive public and private campground facilities, dozens of bed and breakfasts, and multi-use land trails for water trail visitors who want to spend more time in the area. As you cross under the Highway 13 bridge at the Turkey River Park (#38), all remnants of town are left behind. The river stays reasonably straight until you paddle past a large spring-fed stream called Robert’s Creek. Robert’s Creek provides a vital habitat for many spawning species of fish including smallmouth bass and redhorse. From the creek, the river meanders through a narrow valley with wooded bluffs. After floating through a set of enjoyable riffles, historic Motor Mill can be seen down river on your left. Ride the riffles past the mill and through the leftward bend, where takeout (#32) will be on your left. Beyond the Motor Mill Access, the next take-out point is 12.4 miles downstream at Garber (#20). Gradient: 3.4 feet/mile. The remote 12.4 mile stretch from Motor Mill to Garber may provide the best scenery of the Turkey River Water Trail. Your river retreat begins at the access just downriver from Motor Mill (#32). Motor Mill operated from 1869 until 1883 when a large flood severely damaged the dam. After paddling past a farm, a veteran group of red cedars stand guard on a narrow limestone bluff. The timbered ridges on both sides of the river rise high and close together giving this stretch a remote canyon feel. On this section of the river you will float past numerous scenic 150-foot vistas, abundant wildlife, and 100 year old native white pines growing from limestone rocks. Seven miles downriver from Pine Creek, the Volga River enters the Turkey. After going under the Elkport-Garber bridge, you curve left and the takeout is just past the next bridge on the river-left (#20). This section of the river has a gradient of 3.4 feet per mile. From Garber, it is 7.5 miles to the next access at Osterdock (#12). Those choosing to continue on the water trail will journey 7.5 miles to the Millville Access (#5). The final 5 miles of the Turkey River Water Trail will take paddlers to the mouth of the Turkey River where it empties into the Mississippi River. At the mouth, turn right and travel downstream on the Mississippi a short distance to the Ferry Landing Canoe Takeout.